Golden State Warriors defeats Cleveland Cavaliers to win 2015 NBA Championship (Video Highlights, Top 5 Plays, Mini-movie) - Balita Boss! 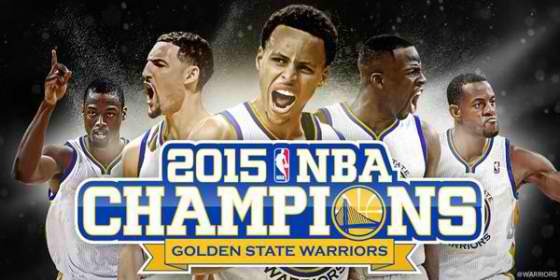 The Golden State Warriors defeated Cleveland Cavaliers 105-97 in Game 6 to win the 2015 NBA championship 4-2. Andre Iguodala, a man who did not start a game all season until midway through the Finals, was named finals Most Valuable Player after averaging 16.3 points, 4 assists and 5.8 rebounds in the series, all while defending the game's best player, LeBron James. In Game 6, he scored 25 points and added 5 rebounds and 5 assists. Iguodala, along with Season MVP Stephen Curry, who also scored 25 points, and Draymond Green with his first career triple-double (16 points, 11 rebounds, and 10 assists) led the Warriors to their first title since 1975. Head Coach Steve Kerr became the seventh rookie head coach to win the NBA title. For Cavaliers, James had 32 points, 18 rebounds and nine assists and was dominant during the series averaging 36.6 points, 12.4 rebounds, and 8.4 assists per game, showing why he’s the world’s best player.